Kanna is the first detachment of Naraku. She appears to be a ten-year-old girl with white hair and clothing. 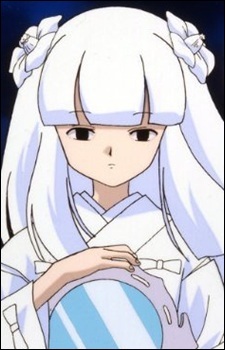 As a "concealed incarnation" of Naraku, Kanna has no scent and no demonic aura, making her undetectable to InuYasha's senses and immune to demonic aura-related effects such as the Hakurei-zan barrier. Kanna is the only incarnation that Naraku trusts with important information about his actions, allowing her to give orders in his place. Kanna carries a demonic mirror that can steal the souls of those reflected in it. Once a soul is trapped by her mirror, Kanna can control that person's body to carry out her bidding. However, the mirror can be overwhelmed by an especially powerful soul such as Kagome's, forcing Kanna to release all of the trapped souls before the glass shatters. The mirror can also create a glass demon to copy the abilities of whatever it reflects, though Kanna herself suffers damage when the glass demon is wounded. In her last battle, Kanna is ordered by Naraku to commit suicide, shattering herself and her glass demon into thousands of tiny shards. Driven by Kanna's final thought, one of the shards hits Kagome's right eye and gives her the knowledge of how to destroy Naraku.